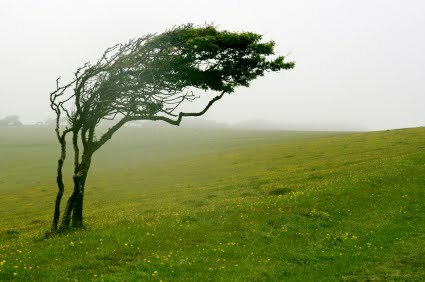 Have you ever seen a tree that's been windblown for years? The branches can be flattened on one side and the primary growth of the tree extends out the other side of the tree leaving it with a lopsided look. We get a fair amount of wind here on the Central Coast of California. Over a few months, its relentless buffeting has killed a few of our newly planted shrubs in the front yard. It has the power to carve the shape and determine the direction of growth of all kinds of vegetation. At times, the wind takes down Monterey Pines whose roots are very shallow and give way when the soil around it becomes rain-soaked. Strong roots are essential to the life of a tree. Even though it gets pounded repeatedly, it can emerge with new growth and resilience thanks to its root system. So it is with us as people navigating the changes in life. Those who have strong roots are better able to hang on in tough times when unexpected challenges, adversity or setbacks come our way. In a recent conversation with a young woman, I learned about her childhood and adolescence with parents who abused drugs and whose lifestyle provided no roots or guidance for the young girl. Now in her 30's she is finally learning to put down roots. She is aware of life's pitfalls after observing her family's sad choices and the consequences they've faced. Those lessons now give her wisdom about her own choices and a root begins to grow when she makes healthy decisions. Her life may be windblown at times like a bad hair day that lasts for months! But as long as she has a healthy root system, she has a better chance of survival. The winds don't diminish her in any way, but they do test her and her root system. My guess is that those lopsided trees in my part of the world must have some strong root systems which have grown in the direction needed to keep the tree stable. Life Coaches come alongside people in windy times and help them as they strengthen their root system.